A solid five years had passed since I last graced the QMU. On that occasion, Kula Shaker provided the entertainment, and the last morsel of my twenties bopped along to the sounds of my teens. This time however, an entirely different spectacle was exhibited at the University Gardens venue inside Jim’s Bar; the eighth and final show for 2014, of Aloud – the cavalcade of spoken word talents, was tonight’s hot ticket in town. The brain-child of Ireland’s Syd Briscoe and New York’s Heather Margaret St Clair initiated due to a significant dearth of spoken word opportunities around the Glasgow University campus. Rather than tie the event in to a student stranglehold, Aloud was engineered to welcome poets and performers from all realms to step up to the microphone – and test themselves in front of a friendly, uncontaminated and responsive audience. The decision to make this a free event of course endeared itself to students and literary veterans alike. Of course, where the already-established Verse Hearse, held within the confines of the Gilchrist Postgraduate Club, offers itself to the ears of postgraduate students and staff, the ideology behind Aloud is perhaps one of a more raw and wide-eyed look into performance poetry – the Simba to the Verse Hearse’s Mufasa. Its refreshing fáilte is carefully tuned in to the Glasgow spoken word scene mentality where both rookies and seasoned slammers extend appreciation and consideration when fellow performers are afforded stage time. This is not to say that this event was libraryesque (Yes, I just invented a new word); it was a student union after all. Minor disturbances included one female bursting through the doors with her skirt tucked into her underwear, and another attracted intoxicated students holding one another up before the clock had even ticked 10pm. This was delicately handled by the organisers, and did not spoil the otherwise-engaged crowd. A strong focus on spoken word, sprinkled with flashes of clever performance poetry, and topics ranging broadly from anti-whaling to mental illness absorbed the audience’s attention. David Forrest’s benevolent poem ‘Cross’ leant itself to a compassionate look at the symbolism of a crucifix (“Bits of skin like cracked paint”), while Lynn Pilkington’s marvellous piece ‘City Girl’s Mission’ cavorted wonderfully between the persona of being strong and self-sufficient with ineffable, romantic notions (“Waiting for the rose tinted glasses to kick in”). In poets such as Callum Bannerman and Ross MacFarlane, and indeed the afore-mentioned hosts Briscoe and St Clair, it became clear that Glasgow’s continuing ascent in spoken word has plenty more worthy champions willing to advocate the good news that the city’s literary scene is flourishing. The first Aloud zine is earmarked for January 2015, new members are surfacing at each live event, and a promising YouTube channel is devoted to filming participating poets who may otherwise never have had the opportunity to see their poems on the internet. Few could argue that Aloud is a fantastic addition to the current spoken word scene in Glasgow, permitting new audiences and knocking down barriers which once existed (No, you don’t require a friend in the university to sign you in). As for negative points about the evening……..the diet coke was rank. 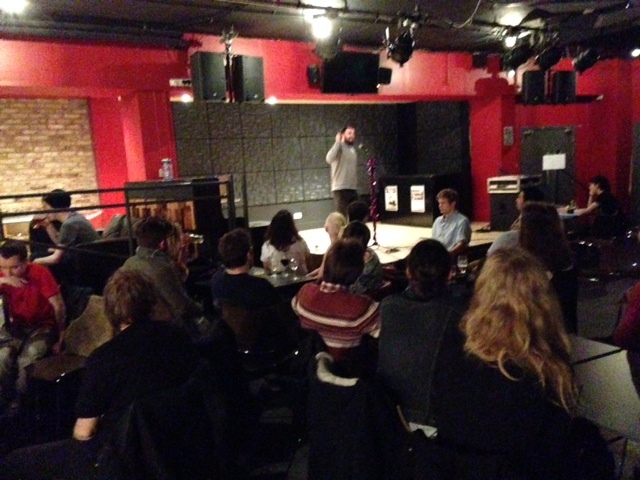 Last time, I left the QMU to Shaker’s Crispin Mills’ wailing Hush to an adoring crowd. This time, everything was very much Aloud. 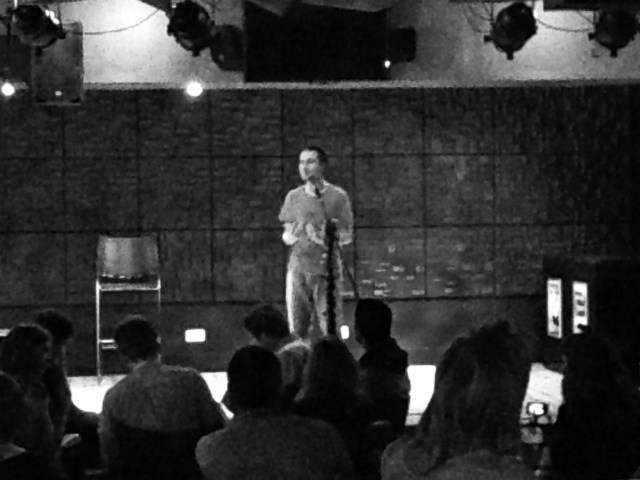 Last Monday at Rio – Slam! !